Now you can apply for a permanent family visa online. There is no need to visit any office; you can apply for it from your computer. The procedure to apply for a permanent family visa is very simple and we have tried to explain it below. We shall be providing a step by step guide to applying for a permanent family visa online in the below article. If you are not comfortable with the online application, you can still apply for the permanent family visa through a manual procedure which has been explained in this article “Apply for Permanent Family Visa through Istiqdam”. First of all, you will have to deposit the fee for the permanent family visa. Many expatriates deposit the fee in the wrong account as SADAD procedure is a bit confusing and they have to deposit it again. It is better to read this link and check the exact account where you need to deposit the fee “Payment of Fee for Permanent Family Visa”. However, if you are a government employee, you are exempt from making any such payment. If you don’t have an account with Ministry of Interior, the procedure to register for an account is explained in this link “Register for Abshir or MOI Account”. After depositing the fee, you need to login to MOI Account. The procedure of logging into account has also been changed a little bit and it has been explained in this link “Procedure to Login to MOI Account”. After logging into the MOI Account, just click on the E-Services and look for the tab “Expatriate Affairs” on the left-hand side. When you will click on it, a drop-down list will appear from which you will have to select “Family Visa Service”. It is important to mention here that this application is for Permanent Family Visa. The online procedure to apply for family visit visa has been explained in this link “Apply for Family Visit Visa Online”. Important Instructions for Istiqdam Family Visa Service: After clicking on the “Family Visa Service” a new page will appear containing the instruction for the family Visit Visa. It is important to read these instructions before going further. The following page will appear along with the important instructions to apply for a permanent family visa. Now you will have to click on the “New Family Visa Application” after reading the instructions. Son's with age greater than 18 are not eligible for Family visa. Family visa is valid or can be issued only for one wife at any point in time. Applicant Occupation should be within the allowed occupation list. A new page will appear containing your full details including Full Name, Iqama Number, Passport No., Passport Expiry Date, Religion, Mobile Number, Nationality, Iqama Expiry Date, Passport Issue Date, Passport Issue Place and Profession on your Iqama. It will also be containing the information about your sponsor. 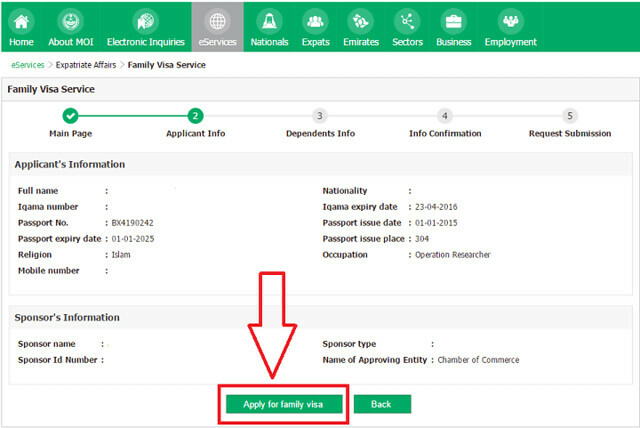 Just make sure that the details fetched by the MOI System are correct and click on the tab “Apply for Family Visa”. 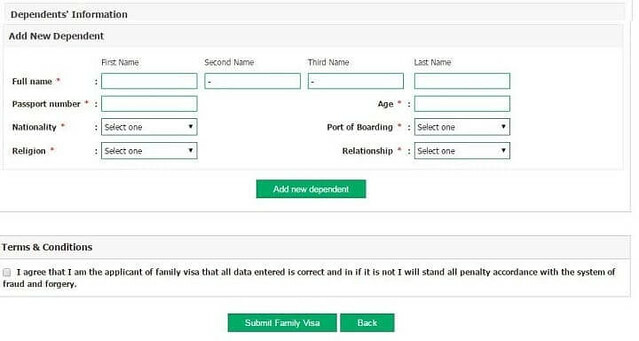 Instructions to fill the Online Form for Permanent Family Visa: After clicking on “Apply for Family Visa”, this page will appear on your computer screen if you have paid the fee for the permanent family visa. This is an online form for a permanent family visa. You will have to fill the details like amount of Salary in SAR, Level of Education, Date of receiving the highest level of education and major subjects in it. 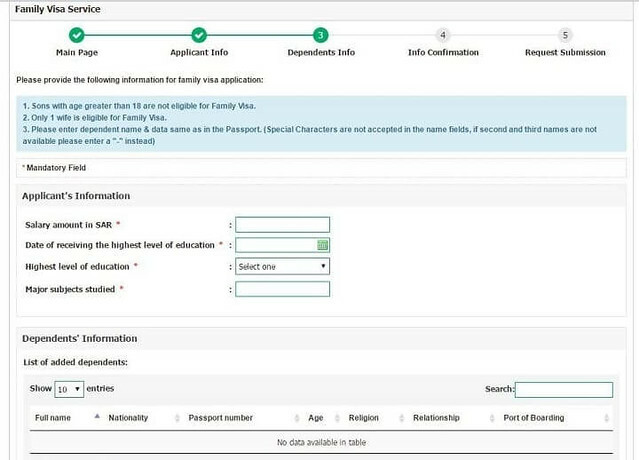 After filling out this information, you will have to fill the name of the dependents, passport number, their age, religion, relationship with you and Port of Boarding. Port of Boarding means the city in which your family will stamp the visa on their passport. I suggest my followers apply it online using the new system thou they can still book for an appointment thru the old one. For expats, the port of boarding is written in Arabic, they must be careful and an Arab co-worker must assist them to properly provide the accurate info. Please enter the name of dependent and data same as a passport. In case the second and third name of the dependent is not available, you just need to write “-” in the second and third name. All the information entered at this point must match with the passport details of each dependent. In the case of wrong entry, your application can be rejected. 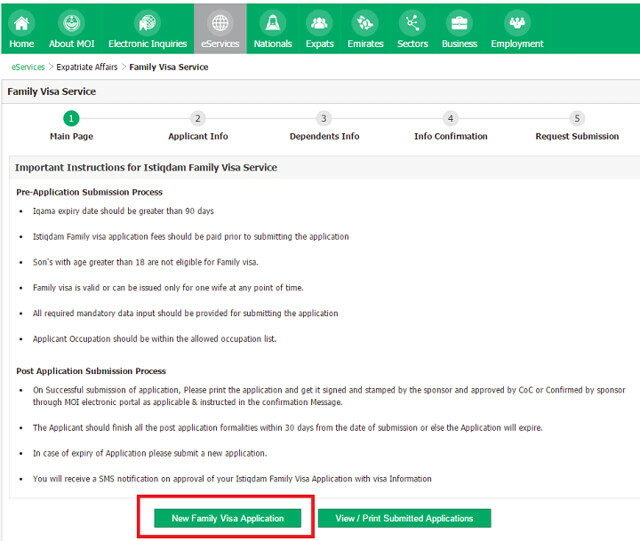 After filling the information, you will have to check the box for terms and conditions in order to agree with them and click on the “Submit Family Visa”. If you are not able to enter the nationality of your dependents, try the Internet Explorer to fill out the application. On Successful submission of application, please print the application and get it signed and stamped by the sponsor and approved by Chamber of Commerce or Confirmed by the sponsor through MOI electronic portal as applicable & instructed in the Confirmation Message. Please have a look in the “Important Points about Attestation from Chamber of Commerce”. You will also need to get the application activated, the process they call it “Tafeel” in Arabic or activation. The Applicant should finish all the post-application formalities within 30 days from the date of submission or else the Application will expire. Please do not cancel your Istiqdam appointment to apply for the permanent family visa as you may need it if your application is not processed online. As soon as your application is successfully submitted, your online appointment of Istiqdam to “Apply for Permanent Family Visa through Istiqdam” will automatically be canceled. Do we need the attested degrees and other documents to apply for a permanent family visa online? Normally, they don’t ask for it. However, I would suggest all of you prepare for the documents in the same way as you used to prepare while applying for a permanent family visa through Istiqdam. How to check Saudi visa status with passport number?